Join in 5 minutes the Bellevue plateau (1800 m) and enjoy many hiking trails in a unique landscape overlooking the Mont Blanc. 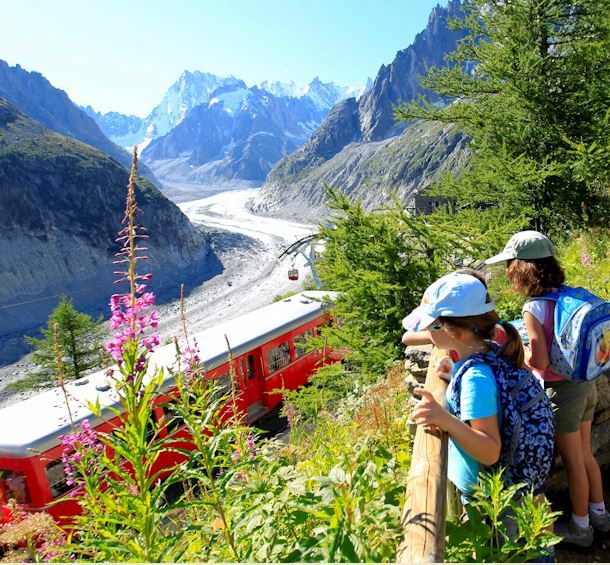 Access is also possible with the Tramway du Mont-Blanc goes up to the Nid d'Aigle in summer (starting point for the ascent of Mont Blanc by the famous "Normal Route" )and in Bellevue in winter. Disabled: 7.50 to 9.50 € (Handisport & PRM, one-way ticket €7.50. Round-trip ticket €9.50.). These rates are the "pedestrian" rates applicable to the Bellevue cable car and the Prarion gondola. From 08/06 to 28/06/2019, daily between 8 AM and 5.30 PM. From 29/06 to 24/08/2019, daily between 7.30 AM and 6 PM. From 25/08 to 22/09/2019, daily between 8 AM and 5.30 PM.